Jobsite remounted Pericles April 7-11, 2010, at the Shimberg Playhouse in preparation for it's Off-Broadway Premiere. Pericles – Prince of Tires made its Off-Broadway Premiere April 15-17, 2010. It was produced by Jobsite Theater at New York's HERE Arts Space. The production was presented through HERE’s Supported Artist Program, which provides artists with subsidized space and equipment, as well as technical and administrative support. Both the World and Off-Broadway premieres were directed by David M. Jenkins. The stage manager was Xylina Golding. 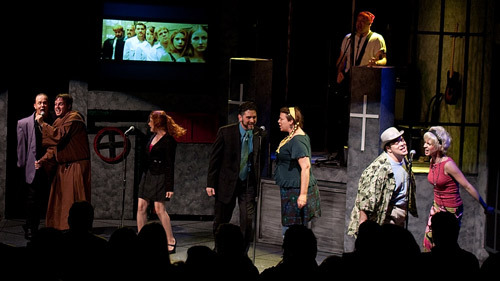 The lighting and set were designed by Brian Smallheer; the costumes were designed by Katrina Stevenson; sound was designed and engineered by Kevin Kennedy and operated by Summer Bohnenkamp-Jenkins; video was designed by David M. Jenkins and engineered by Shawn Paonessa; the vocal coach was Amy E. Gray; music was recorded by Roy Coopervasser. Check out the bios for the World/Off-Broadway Premeire cast and crew. David M. Jenkins and Jobsite Theater for more than we could possibly list here.